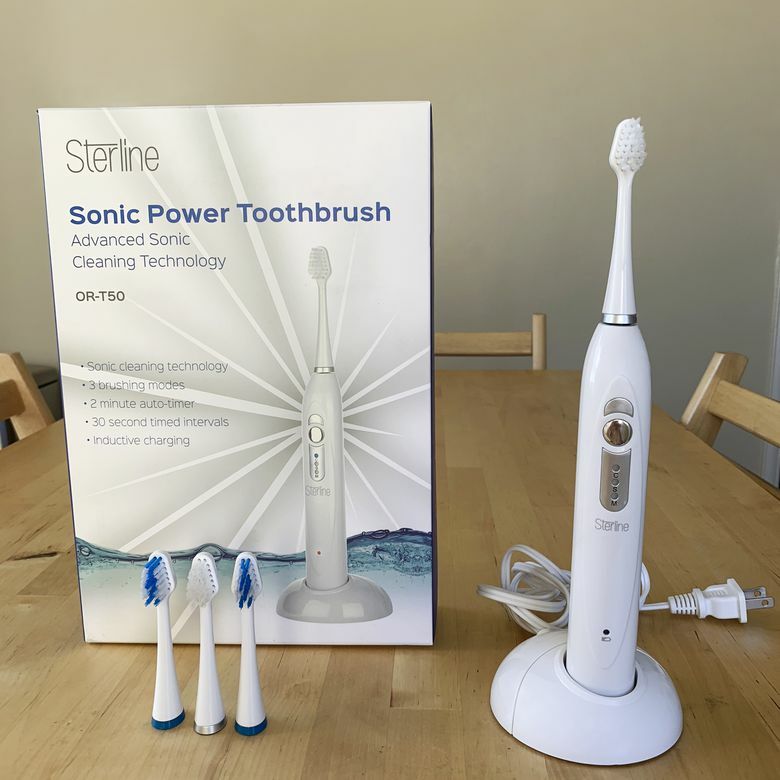 The Sterline Sonic Power Toothbrush is a sleekly-designed, user-friendly electric toothbrush that offers a basic clean at a great price. The Sterline Sonic Power Brush is a basic electric toothbrush with high style and an affordable price. It has a sleek design that ensures a thorough and well-distributed clean through a built-in 2-minute timer that alerts users to switch mouth quadrants every thirty seconds. With such a large range of available electric toothbrushes at wildly different price points, it’s important to know you’re choosing an option that can meet your particular oral care needs. That’s why we tested the Oral-B Pro for a week, evaluating its design, price, and usability. The Sterline Sonic Power Toothbrush is both stylish and functional. The base is thin and sleek, especially in comparison to more high-tech electric toothbrushes on the market, which sacrifice beauty for advanced features like Bluetooth capability. The Sonic Powerbrush has a clean silver and white style that would fit into a minimalist bathroom scheme. With a product weight of 5 ounces, the toothbrush handle fits lightly in the hand for an easy brushing experience. It slides effortlessly into the charging base. The Sonic Power Toothbrush has an incredibly easy setup process. The product box contains only three components: the toothbrush handle with already-attached head, a charging base, and two replacement heads. To initiate the charge, simply plug the charger into the wall and place the toothbrush onto the holder. Brush heads slip easily on and off the base. A key detail to note: the toothbrush requires an initial 24-hour charge before first use, so you should plan to set up the product one day in advance. The Sterline Sonic Power Toothbrush is both stylish and functional. The Sonic Power Toothbrush offers a simple and effective brushing experience, but likely won’t appeal to those who prefer extra-firm bristles. The automatic timer runs for two minutes and vibrates at 30-second intervals to ensure equal brushing time on each quadrant of the mouth. There are three mode options, though we didn’t find huge variability among them. They include a Clean Mode for traditional daily use, a Soft Mode for sensitive mouths and a Massage mode for the gums. The Sterline Sonic Power Brush is a basic electric toothbrush with high style and an affordable price. We found the Massage mode to be most distinct, as it pulsates to provide cleaning for the gum areas. The Soft Mode was less firm than the Clean Mode, though both settings were on the gentle side. The white brush head offers a soft clean on all three modes. The blue brush head offers a slightly less delicate but still not ultra-firm clean. Overall, the settings were each effective to their purpose, though we would have preferred at least one option with firmer pressure. After the initial first 24-hour charge, the brush will last for more than a week of brushing at 4-minutes a day. At just under $20, the Sterline Sonic Power toothbrush falls into the lowest available price range for rechargeable electric toothbrushes. Other similarly-priced options also feature three to five brushing modes, two-minute timers with notifications at 30-second intervals and replacement brush heads. If you jump up to the $70 price range, you’ll find toothbrushes that feature pressure sensors, and in the $100 and up category, options with Bluetooth capability and connected apps. The Sonic Power Toothbrush is a great electric toothbrush for the budget-conscious. The Sonic Power Toothbrush is a great electric toothbrush for the budget-conscious but does have similarly-priced peers with comparable features. The Fairywill Sonic Electric Toothbrush, DFirst Electric Power Toothbrush, and Geekerbuy Sonic Electric Toothbrush Travel Set, for example, are all under $30 and also offer 3-5 brush modes and 2-minute timers with notifications at 30-second intervals. The Geekerbuy has five cleaning modes to Sterline’s three, and the Dfirst has a slightly longer 3-year warranty. The Sterline and DFirst have standalone charging bases, while the Geekerbuy and Fairywill only offer a USB cord. Take a look at other product reviews and shop for the best electric toothbrushes available online. The Sterline Sonic Power Toothbrush is an effective and intuitive electric toothbrush that provides a gentle clean. It doesn’t have the complex features of its more expensive counterparts, but it will meet the needs of those looking for a basic and affordable daily brush. Product Dimensions 9.5 x 1 x 1 in.